Facial aesthetics and facial ageing are two sides of a coin. The face has superior importance when it comes to beauty and aesthetics, without any doubt. Although facial aesthetics seems simple — especially for beginners in the field — the truth is, this subject is quite complex. The editors Alession Redaelli from Milan, Italy, and Frédéric Braccini, Nice, Paris, France, succeeded in creating a wonderful handbook on scientific and historical background, ethical and legal problems and a detailed description of techniques and procedures dedicated to improve the appearance and reconstruct the shape and function where it was lost. The Florentine plastic surgeons of the Renaissance — the time when modern Western medicine was born — understood the loss of beauty as the loss of luck or unluckiness. They understood plastic surgery as a way to regain luck and happiness. The editors and 19 co-authors from France, Italy and Monaco have done a very good job. In eight parts and 27 chapters, numerous aspects of ageing, anatomy, technical devices and materials, anaesthesia and legal and historical notes are presented. The therapeutic parts are divided into periocular areas, lateral face, central face and adjuvant procedures, by aestheticians. All the chapters contain medical and minimally invasive and classical surgical treatment options, with detailed descriptions and numerous illustrations Ϳ both schematic and clinical. A special chapter is dedicated to dental health and beauty. 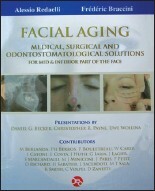 This book should belong on the bookshelf of all who are interested in aesthetic medicine and surgery.